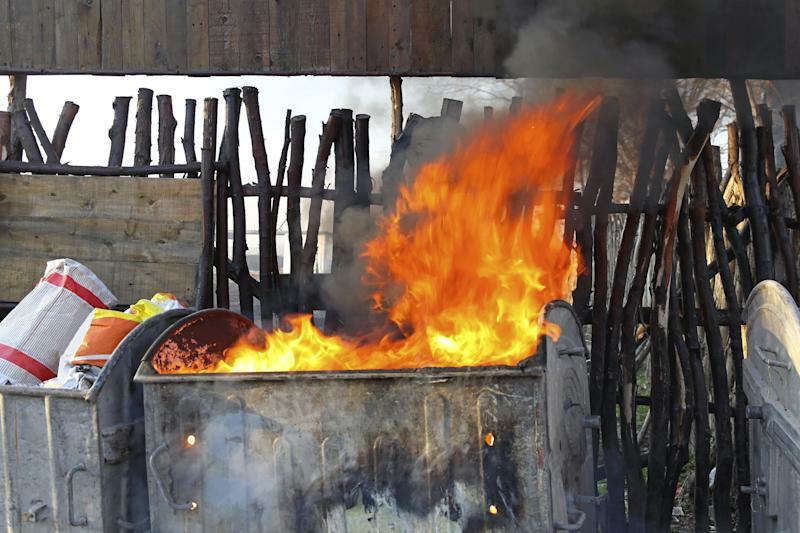 The original meaning of "dumpster fire." Now when a man mansplains what the word “mansplain” means, he can do it with an added air of arrogance — because it just became an official word. The verb, meaning “to explain something to a woman in a condescending way that assumes she has no knowledge about the topic,” was among850 new words Merriam-Webster added to its dictionary, the publisher announced Monday. Other new words Merriam-Webster added to “embiggen” (meaning to enlarge or expand, reportedlyderived from “The Simpsons”) our collective language include “self-care” (“health care provided by oneself often without the consultation of a medical professional”) and “dumpster fire” (“an utterly calamitous or mismanaged situation or occurrence”). And if these words seem eerily reflective of the current political and cultural climate, there’s a reason for that. Bandwidth: (noun) the emotional or mental capacity necessary to do or consider something (to see additional meanings, click on “bandwidth). Bitcoin: (noun) a digital currency created for use in peer-to-peer online transactions. Glamping: (noun) outdoor camping with amenities and comforts (such as beds, electricity, and access to indoor plumbing) not usually used when camping. Hate-watch: (verb) to watch and take pleasure in laughing at or criticizing (a disliked television show, movie, etc.). Narcissistic personality disorder: (noun) a personality disorder characterized especially by an exaggerated sense of self-importance, persistent need for admiration, lack of empathy for others, excessive pride in achievements, and snobbish, disdainful, or patronizing attitudes. Subtweet: (noun) a usually mocking or critical tweet that alludes to another Twitter user without including a link to the user’s account and often without directly mentioning the user’s name. Tzatziki: (noun) a Greek yogurt sauce made with cucumbers and garlic. Welp: (interjection) used informally like well (as to introduce a remark expressing resignation or disappointment). Wordie: (noun) a lover of words. Yorkie-poo: (noun) a dog that is a cross between a Yorkshire terrier and a poodle and especially a miniature or toy poodle. Check out more new words over atMerriam-Webster.